The suffering in Yemen will not stop unless the West stops supporting Saudi Arabia with arms and tacit consent and puts a stop to the war. On October 8, a warplane from the Kingdom of Saudi Arabia fired on the funeral of Yemeni interior minister Jalal al-Ruwaishan’s father. The attack killed 140 people and injured over 600. It was a gruesome strike. There was no military target there or nearby in the Sana’a neighbourhood of the funeral hall. The fighter came for blood and got it. Condemnation of the Saudi strike came swiftly although this is not the first such mass attack on civilians. The richest Arab country – Saudi Arabia – has been bombing the poorest Arab country – Yemen – since March 2015. In the months that followed the first strike over 11,000 people – mostly Yemeni civilians – have been killed. 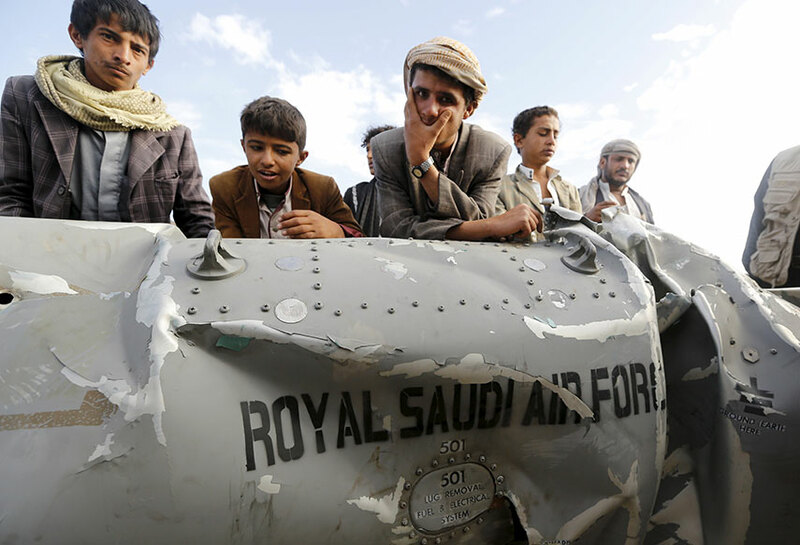 Saudi aircraft have hit marriage parties and funeral halls, marketplaces and town squares. Massacres have been common, but unheralded. Three million Yemenis out of a population of 24 million have been displaced from their homes. This entire war has gone by without much comment. In fact, the opposite has happened as Saudi Arabia’s depleted stores of munitions have been hastily replenished by Canada, the UK and the US. On average, the US sells $2 billion worth of weapons to the Saudi kingdom. These past months – despite evidence that these weapons have been used to massacre civilians – the US has continued to supply Saudi Arabia with arms. Hushed conversations have taken place at the UN Security Council about calls for a ceasefire, but there has not been an outcry since the US provided diplomatic cover to Saudi Arabia. It was only after the funeral massacre that the UK circulated a draft resolution calling for an immediate ceasefire and for the delivery of humanitarian aid to Yemen. Yet, at no point has the UK even suggested an arms embargo. BAE Systems – a UK arms manufacturer – is currently in talks with the Saudi government to sign another arms deal. Notably, since 2010, the UK government has overseen arms sales worth £6.7 billion. In the past few months, Saudi aircraft have also hit two Doctors Without Borders hospitals, forcing the charity to withdraw from six other hospitals in northern Yemen. The medical system in Yemen is now in disarray. 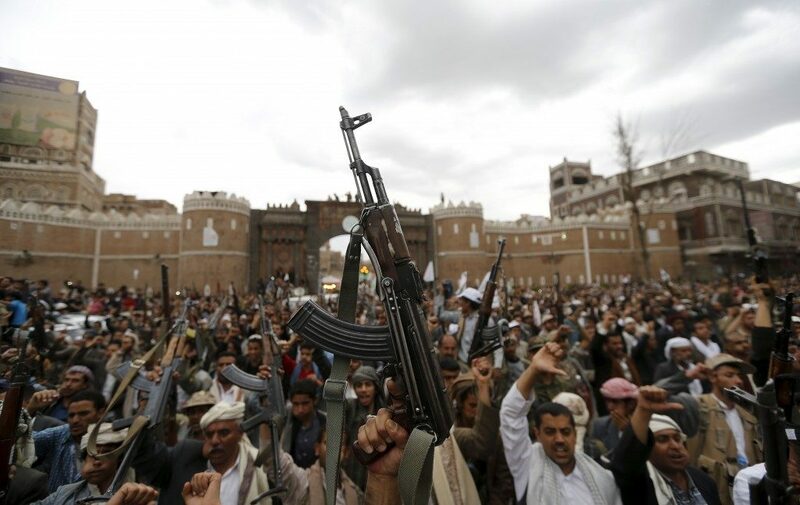 Yemen has been experiencing domestic tensions since the unification of the country in 1990. Several groups within the country have felt cut out by the various deals negotiated by the elite. The long-standing president of Yemen, Ali Abdullah Saleh, who ruled from 1990 to 2012, was ousted by popular protests during the Arab Spring. Saleh had collaborated with the US in its war against al-Qaeda in the Arabian Peninsula (AQAP) and had also led the fight against Saudi Arabia’s adversary, the Zaidi Houthi rebels in Yemen’s northern lands. After Saleh’s ousting, his deputy, Abdrabbuh Mansour Hadi won an uncontested election but immediately tried to smother all the political contradictions that had come to light during the mass protests across the country from 2011 to 2012. Hadi was carrying water for Saudi Arabia, which has long wanted a pliable neighbour at its southern border. Even then he had warned that the situation in Yemen was ‘worse than Afghanistan’, with the presence of the Zaidi Houthis, the AQAP, pirates in the Gulf of Aden and other groups all armed and dangerous. In September 2014, the Zaidi Houthis – backed by their former adversary Saleh – rode into Sana’a, capturing most of Yemen’s population centres. Hadi fled to Saudi Arabia, where new king Salman and his son Mohammed Bin Salman were itching for a fight. Father and son successfully tipped over the complex chessboard of Yemen’s politics with the war they initiated in March 2015. Surprisingly, a few days after the funeral bombing, the Houthi-Saleh forces fired missiles towards a US destroyer – USS Mason – that was sailing through the Red Sea. The USS Mason then fired back on radar installations along the coast, destroying them. Even though the combined forces of the Houthis and Saleh have long accused the US of being a co-belligerent in this war, supplying arms and intelligence, there is little likelihood that the US will be drawn deeper into this conflict. With an ongoing war in Syria and the fight for Mosul (Iraq) now in progress, the US will be content to provide arms to Saudi Arabia and allow the Yemeni sector to fester. The US has, for over a decade, been bombing Yemen – but mainly from its drones. Notably, these drones have been used to attack AQAP leaders based in south-eastern Yemen. As recently as February, a US strike killed AQAP leader Jalal Baleedi. Both AQAP and ISIS have made serious gains in south-eastern Yemen over the course of this war. Saudi aircraft have avoided striking AQAP targets. In fact, AQAP fighters have appeared to benefit from Saudi air cover. The organisation’s movement in the area between al-Bayda’ and Ibb has pushed against both the Houthi-Saleh forces as well as the Hadi in the south. There are even reports of mobilisation on the Saudi side of the border, in the vicinity of the city of Najran. The gains made by AQAP are not merely territorial – they have also been able to gain legitimacy in this war, fighting against Saudi’s adversary. The US has long suggested that AQAP is the most dangerous al-Qaeda franchise and the organisation’s gains must be worrying to Washington. An Omani plane flew into Sana’a to carry away injured survivors from the funeral bombing. On that plane came members of the Yemeni negotiating team, who had been stranded in Muscat. This team had come to Kuwait from Yemen to meet with representatives of the Saudis and their Yemeni allies. The UN had put great hope in those meetings, to no avail. The Saudis demanded that the forces of the Houthis along with Saleh quit Sana’a and disarm. This was simply not going to happen. The Saudis made no strategic gains. Indeed, the Houthi-Saleh forces felt that their survival was synonymous with victory and they did not want to surrender at the negotiation table. They had tasted victory and wanted to experience it in the peace talks. The peace talks fell apart in Kuwait, as they had fallen apart previously in Geneva. There is now almost no hope of a UN-brokered agreement unless the Saudis and their allies agree to give the Houthis and Saleh something. Exiting this intractable war is not going to be easy. In mid-September, rumours travelled about regarding a US démarche to the Iranians, hinting at an Iranian role in the peace talks. Iran rejected the news publicly, saying that no such discussion had taken place. The US-Iranian nuclear deal that was signed in the summer of 2015 irked Saudi Arabia. Some say that the Saudi exertions in Yemen and in Syria are designed to put pressure on Iran. Neither attempt has succeeded. In fact, Iran’s strategic position in West Asia is now stronger. The Syrian government of President Bashar al-Assad is beholden to Iran and Russia and the Houthi-Saleh forces – who had little tying them to Iran – now see Iran and Russia as allies. Saudi Arabia has not been able to come to terms with the stalemate. It cannot win and it will not be able to convince the Houthis and Saleh to stand down. Deep problems in Saudi Arabia’s economy, as well as defeats in Syria, have put pressure on the house of King Salman. If the pressure rises on Saudi Arabia it might be forced to back down. No such pressure comes from the West. The pride and the legitimacy of the new king suggest that an end to the war can only come with the appearance of victory. Since this is not possible, there is no easy end to the war. The West will continue to arm Saudi Arabia. The senseless suffering of the Yemenis will continue. There is no end in sight. Vijay Prashad is the author of The Death of the Nation and the Future of the Arab Revolution from LeftWord Books.